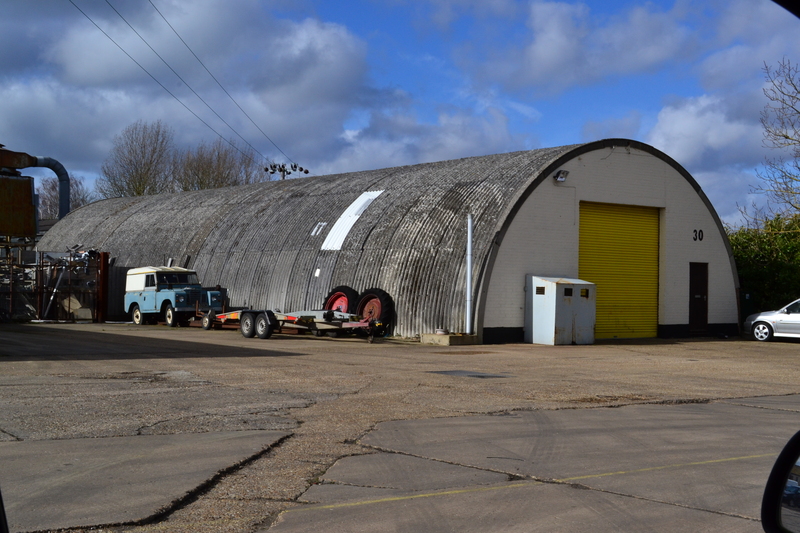 RAF Witchford a revisit to a fascinating airfield. I originally visited RAF Witchford some time ago but was lucky enough to have an invite to a gathering taking place earlier this month at the site. It was a very memorable day indeed. Trail 11, which this forms part, can be found here. Witchford is found a few miles East of Mepal in the shadows of Ely Cathedral. Now an industrial estate, a large amount of the site is still in existence (and being used) and freely accessible to the general public. This makes it one of the rarer airfields around in terms of visiting. 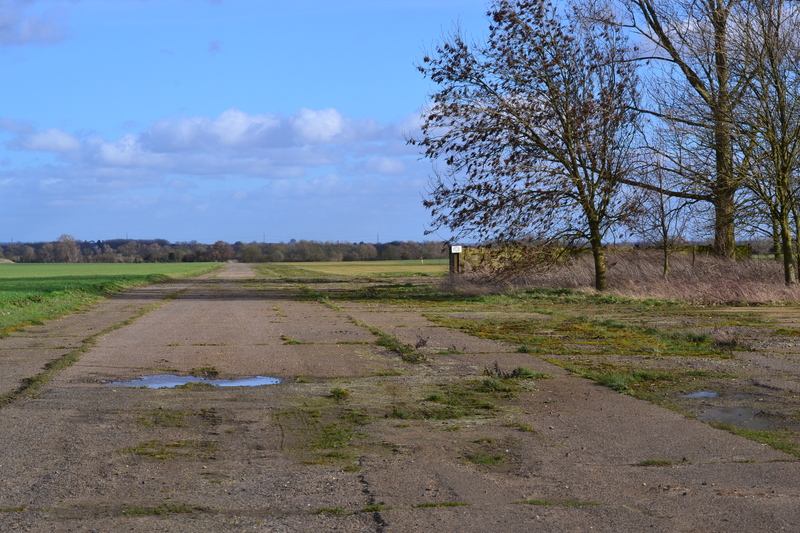 RAF Witchford Perimeter Track Looking South, the B1 Hangar is to your right. A typical triangular Class A airfield, it had two runways of 1,408 and 1,415 yards and a further main runway of 2,010 yards, all concrete and 50 yards in width. The technical site was located on the western side of the airfield behind the long and straight perimeter track. A number of Nissen workshop huts were constructed along with the standard 343/43 Watch Office, Braithwaite water tower and 150 or so supporting buildings. As with all bomber airfields, the bomb store was well away from accommodation and was located to the southern side. Being a large airfield, it had three hangars, two T2 and one B1, and a total of 36 loop-type dispersed hardstandings. The accommodation sites (14 in total), were spread out well behind the technical site predominately where the village now stands and beyond. 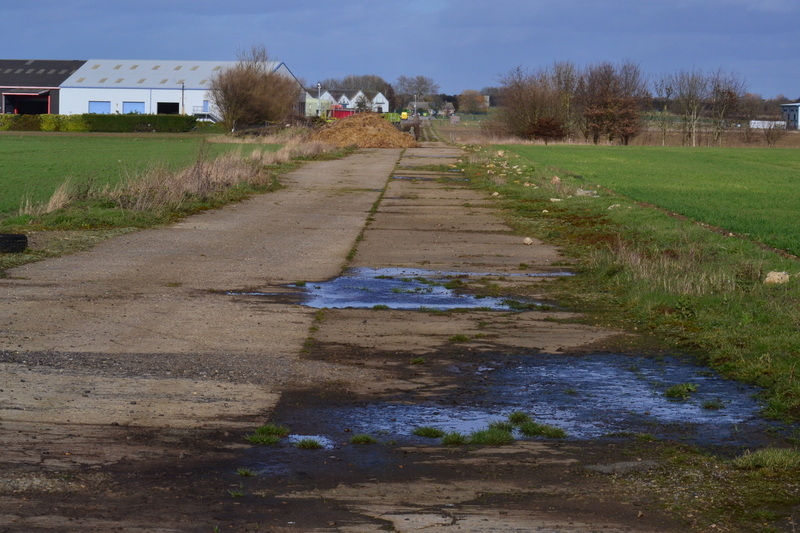 The main entrance to the airfield, also to the west, is now a small track leading to housing known as Bedwell Hey Lane. In total Witchford was designed to accommodate 1,502 men and 230 female ranks and it officially became operational in July / August 1943. 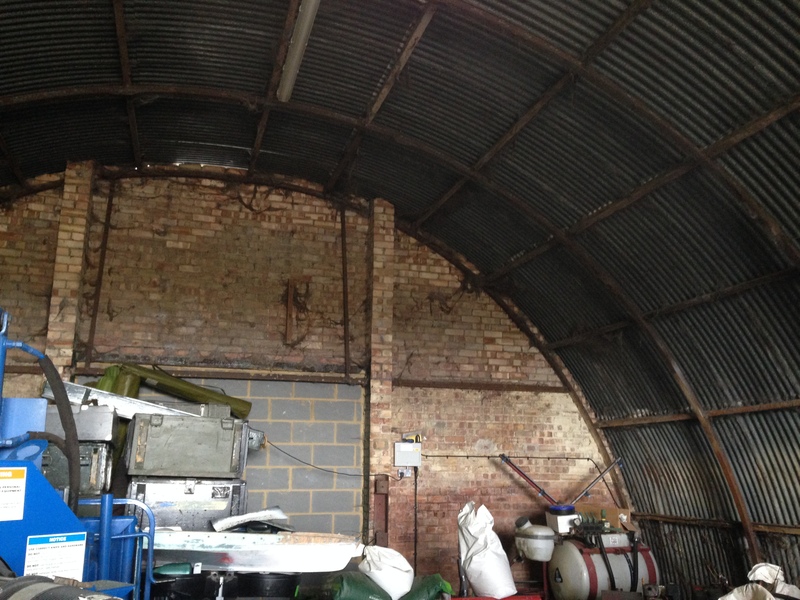 Original Nissen Hut now used for stores. Witchford was served initially by Stirling IIIs of the newly formed 196 sqn RAF, whose first operational flight took place on August 28th that year. But as heavy operational losses built up, it soon became obvious that the large bomber was ‘unsuitable’ for long distance bombing missions and gradually, squadron by squadron, they were replaced by the more superior Lancaster to which the business park gets it’s modern name. As these Stirlings became obsolete for front line use many were redeployed covering glider towing, mine laying and transport duties. During September to November 1943 a number of changes were to happen at Witchford. A second squadron, 195 sqn RAF, was reformed at Witchford (October 1st 1943) using elements of 115 sqn, who were at that time, based at Little Snoring (Trail 22) in Norfolk. A further unit, 513 Squadron, also formed at Witchford (15th September) again using the ill-fated Stirlings. However, 513 sqn never became operational, and were disbanded only two months later. On the night of 26th November 1943, 12 aircraft of 115 Squadron left RAF Little Snoring in Norfolk, to attack the German capital, Berlin. On return, they were to land at their new station RAF Witchford where the ground staff had moved to that very day. Only one aircraft did not make it back that night and this meant that 115 sqn (who in August 1941 had taken part in trials of GEE) were now totally based at Witchford. 115 were still using the Armstrong Whitworth (Bagington) built Lancaster IIs with their Bristol Hercules engines. (My father, the inspiration to my love of aircraft, worked for Armstrong Whitworth at the Bagington site not long after being demobbed). It was with these aircraft that the Squadron dropped the first 8000 lb bomb on Berlin during Air Chief Marshal Harris’s bombing campaign against the German capital. In March 1944, 115 sqn began replacing its Mk IIs with the Merlin engined Mk I and IIIs, aircraft it flew until hostilities ceased in 1945. Currently a stable, the original building will become a Gymnasium. Enemy intruder missions over Allied Airfields were common place, and Witchford and her neighbour Mepal, were no exception. On the night of April 18th and 19th 1944 an ME 410 joined the circuit over nearby Mepal (see above) and shot down two Lancasters both from 115 sqn. A further intruder mission also occurred on the night of April 2oth / 21st but luckily there were no fatalities and little damaged was caused in this attack. 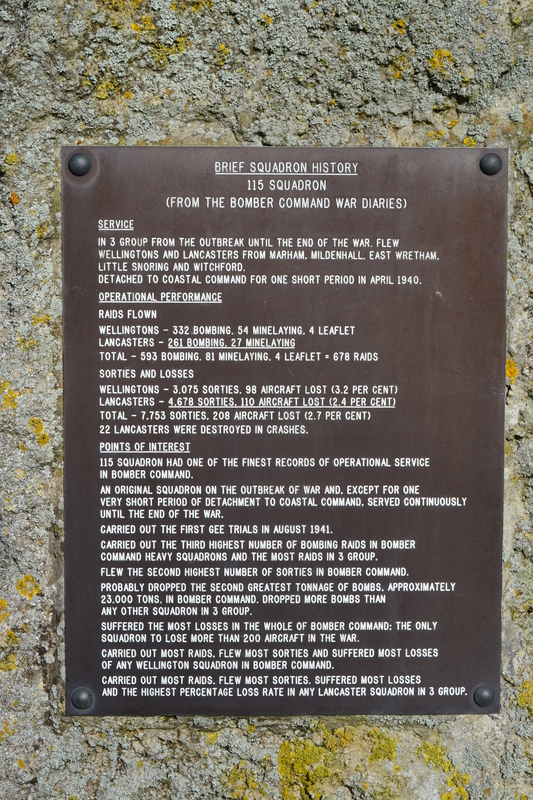 When 115 sqn’s war finally came to an end, it had one of the finest records in Bomber Command. A total of 678 operations in all, second only to 75(NZ) Sqn at Mepal. But the price was high, 208 aircraft being shot down or lost in action. Witchford as an airfield closed in March 1946 with the withdrawal of all operational units at the end of hostilities. Today the site is a small business park, located on the western side of the airfield with a wide range of businesses working where the main Technical site of the field once stood. On entering the park, you drive down a long straight road, this is the original perimeter track. On your right is where the main hangars and maintenance area would have been located. The original B1 still stands today, but it is heavily transformed with new cladding and metal work. If you drive the length of this road you come to a security gate. Just to your right are a number of small huts. These are the original stores and in remarkable condition. Used by local businesses they house machinery and other equipment, but their features and layout clearly represent airfield architecture. Tucked away in here, in the foyer of one of the businesses, is a small but significant museum dedicated to the crews and personnel of RAF Witchford and nearby Mepal. It has a fantastic array of photographs, personal items and one of the Bristol Hercules engines from the downed 115 sqn Lancaster II. A free museum, it has a bizarre feeling to it as workers casually walk through between offices while you peruse the items neatly displayed on the walls. Do spend some time here; it is a fascinating insight into life on the base. (Further details are available later in the blog). After leaving the museum, return back up the road taking the first right turn. On your right is the location of the control tower – now long gone. 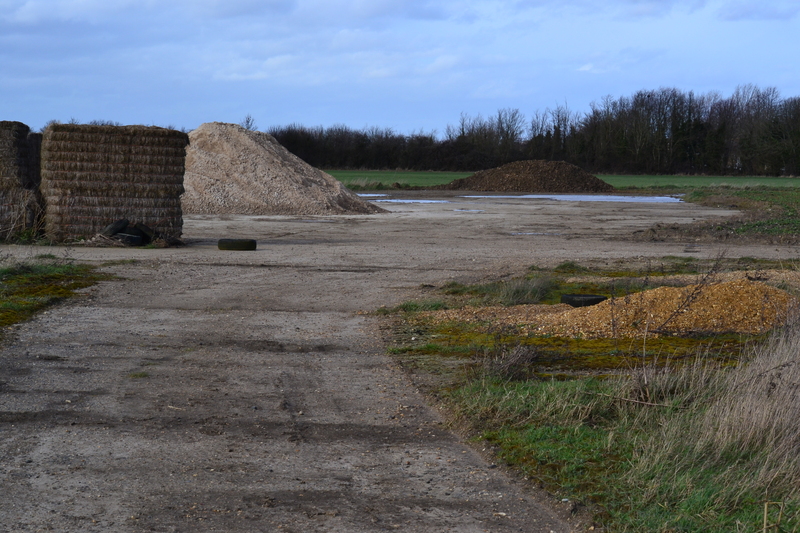 This brings you onto the remains of the main runway. If you drive to the top and turn back, you will see that it has been cut by a hedge that now separates the runway with the field. To the left of the hedge, you can still see the concrete remains of the original track. Continue to the top and turn the corner, then turn right. 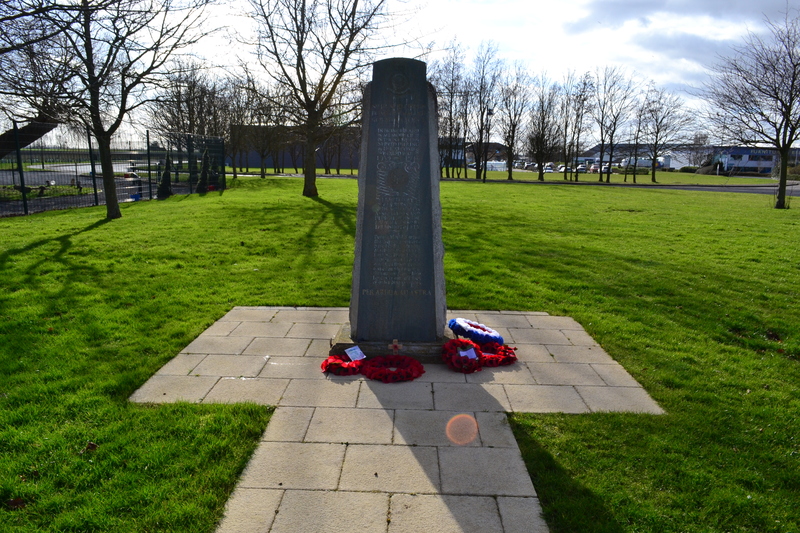 This is the threshold of the runway and joining perimeter and is marked by a superb memorial dedicated to the crews of the airfield. Also on here, is the remarkable ‘factual diary’ of the squadron and makes for very interesting reading. Look back south from here you have views across the airfield, along the perimeter track and down the runway; you just can sense the roar of lumbering bombers on their way to occupied Europe. If you now leave the site, and turn left out of the park, follow the road down and turn left. Drive along as far as you can and stop at the gate. 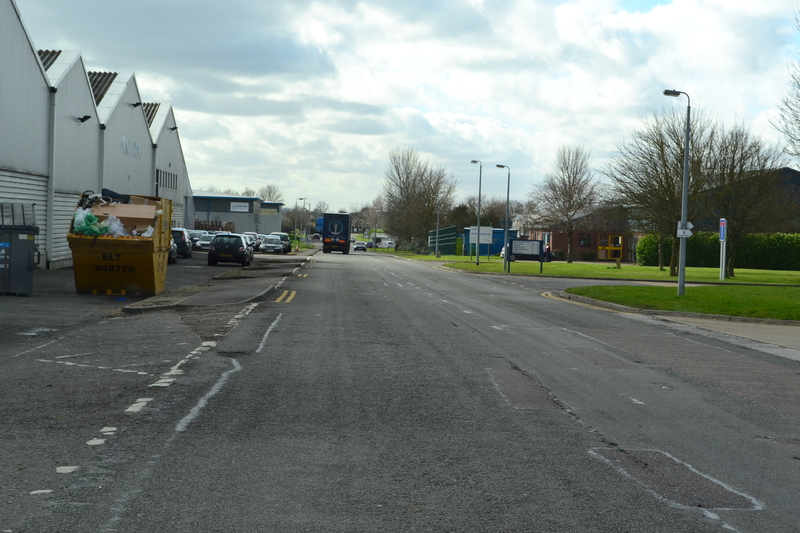 This is Bedwell Hey Lane and the original main entrance to the airfield. Vehicle access is only by permission, but a ‘kissing gate’ allows walkers free access and walks across the field. Go through. On your right are the entrances to various works stations, denoted by covered brickworks, further along to your left is the site of the original guard-house. keep going, and on your left you will see the Nissen huts mentioned previously. You finally arrive at the rear of the security gate you were at earlier. There are several occurences of a worker having stood in the wet concrete, these footprints can be found at numerous points around the site, especially here. Turn right and walk through another farm gate and you are on the remainder of the perimeter track. From here you can walk around a large portion of the perimeter track, having great views across the field. In a short distance you join where the threshold of the second runway would have been, it too is now all but gone. Continue walking round the perimeter track, after a while, you see it narrows, the sides becoming overgrown with weeds, If you look in the adjacent fields, you will find a large quantity of former airfield drainage piping, scattered amongst pieces of building left after demolition. Eventually you arrive at a split in the track. Access straight on is not permitted, but you can take the right fork and in front you will see the low-lying remains of the armoury. Walking down this section will eventually bring you onto the main Ely to Cambridge road. If you look straight ahead and to the right from where you are standing, you will see the location of one of the two type T2 hangars. To your right and behind, is the bomb store, a significant size in its day, covered in huts and stores, bustling with activity; today there is sadly no remaining evidence of this busy section of the airfield. However, this part of the perimeter track is well-preserved and shows use by the local farmer who now uses a majority of the site. But looking across back toward the industrial area, you get a real sense of wartime activity, Lancasters and Stirlings rumbling where you now stand, bomb crews readying aircraft and vehicles hurrying from one aircraft to the next. Take in the atmosphere before walking back the way you came. Keep your eye open to the right. Part way along here, you can see along the length of what remains of the second runway along to the point where you stood earlier by the memorial. The original concrete still evident and witness to the many aircraft that flew from here. A poignant moment indeed. Continue back the way you came taking in views across the filed and the stores area. 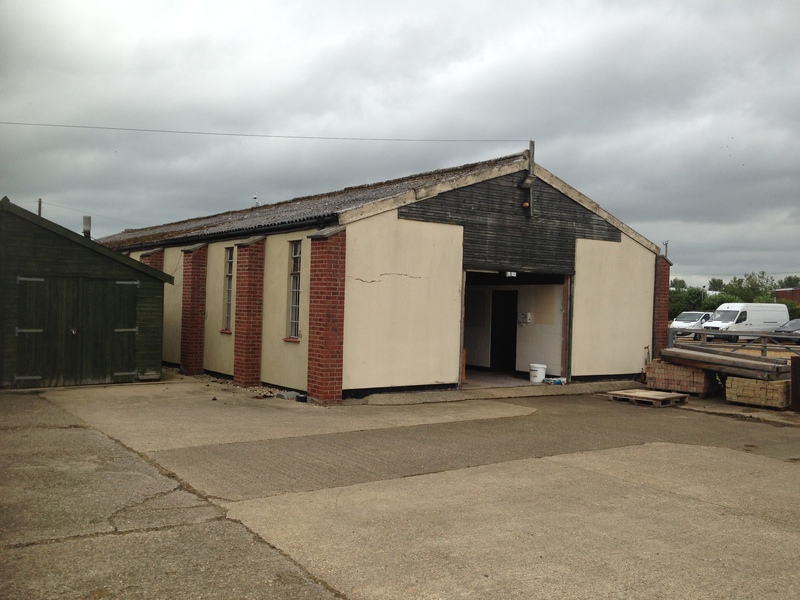 After leaving the site, drive back along the main road away from Ely, you will pass a number of derelict buildings once used by the RAF at Witchford. Indeed one such building is now a small industrial unit, the others overgrown and in a poor state of disrepair. (Photos of both these buildings are available on flckr). One of the happier stories to emerge from wartime Witchford is that of Sgt. Nicholas Alkemade, who given the choice of staying in his burning Lancaster, to die a terrible death, or jump minus his parachute, to a rather quicker death, opted for the latter. Amazingly for him, jumping from 18,000ft he landed in fir trees and soft snow, surviving with little injury. The Germans, after questioning him, confirmed his story after finding burnt sections of his parachute in the aircraft wreckage. He survived the war and returned to England later marrying his sweetheart. See his story here. There are few wartime airfields today that exist in any form let alone accessible to the general public. Witchford has a few little gems tucked away in amongst the now busy business park, none more so than the museum and memorial. But walking round the perimeter track, you do so knowing that many years ago, Lancasters and Stirlings also rumbled here, and that many a young man left here never to return again. On July 12th 2015, I was lucky enough to have been invited to join members of the 115 squadron Memorial project who have painstakingly researched the crash site and details of Lancaster ‘KO-Y’ DS 734, that took off from Witchford and crashed near Pasbrug, Mechelen, Belgium on the night of April 24th/25th, 1944. Together with Sue Aldridge, one of the Museum founders, we met Dave Howell, son of Aubrey Howell DFC who flew Lancasters whilst at RAF Witchford. We were also given a short tour of the buildings by David Brand of Grovemere Holdings, the current land owners of both Witchford and Mepal sites. To them all I would like to say a huge thank you, It was a most memorable day and a great honour to have met you. Sue and her husband Barry, have written a book ‘Memories of RAF Witchford’ which includes an enormous number of personal stories, photographs and detail about the life of RAF Witchford and the people who worked here. It is a must for anyone wanting to know more. 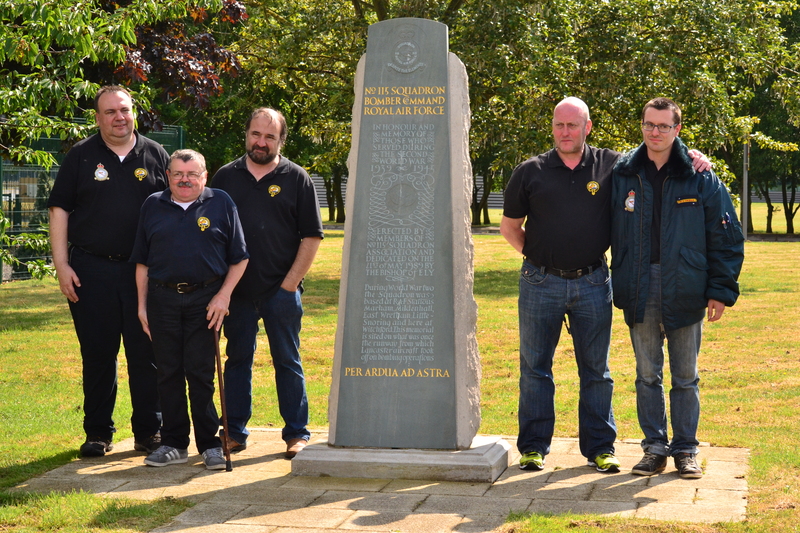 The members of the Belgium memorial Project at Witchford July 2015. ‘Memories of RAF Witchford’ can be purchased from Sue, for details click here. The 115 Squadron Memorial Project website can be found here. My eldest brother Ron told me that he worked on radar in Lancasters at Witchford, he helped to develop the equipment in the bombers; although he never flew on ops (his eyesight was not good enough) but was very proud of the bombing record in the Squadrons there. Ron sadly died two years, in NZ, aged 92. Hi Alan. I’m sorry for the loss of your brother, without men like him the bombers would not have been able to get off the ground, let alone be successful in what they did. Everyone in the Air Force played their part and were vital in ending the war with Germany. You must be very proud of him. Many thanks for reading the blog and for sharing your brother’s work with us. Andy. Just a small remark: The “Nissen hut” is named after her inverntor, the Canadian Peter Norman Nissen, who erected these cheap and easy to erect structures in 1916. Your spelling leads to confusion as “Nissan” is a japanese company. You are so right. Thank you for pointing that out, no matter how many times you read a post something always seems to slip through. Many thanks for noting it I’ll make the change on the page. Appreciate your comment. As always, an extremely interesting blog post. The.”factual diary of the squadron” is a really good idea. It means that any casual walker can have a good idea of what has gone on in this place so many years ago. Thank you. As the blog has gone on I find the history more and more interesting particularly as personal details come out. It helps bring what is in many cases a pile of concrete and rubble, some meaning. Thanks it was a memorable day for all.